By Syncing Inventory on Walmart, you can always have your Walmart inventory match the inventory that is in your store. If you have a Shopify, Volusion or BigCommerce store, we can sync inventory both ways When an order gets placed on Walmart.com, it will adjust the quantity on your website accordingly as well. The image above shows how It can work for a sale on Walmart or on your website to update inventory. An order comes into Walmart, our system automatically downloads it and decreased the quantity on your website for that item (when the rule is enabled to do so). The order gets acknowledged automatically and can automatically be imported to your website. The Walmart Inventory Status screen displays your current inventory either Processing, on Walmart already, or queued for deletion. A dropdown on the top right allows you to select which of these you want to view. If you need to remove a product from Walmart, you can search for the sku to remove and put a checkbox next to it, and click "Add or Remove Checked Items From Inventory". 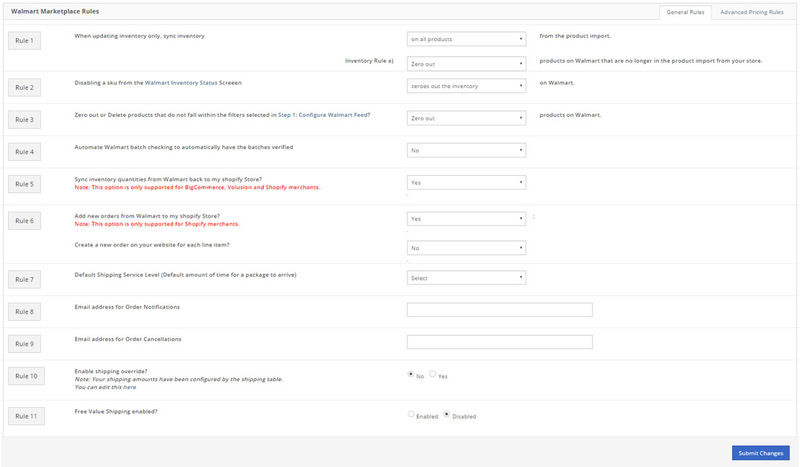 In Step 2, Walmart Rules, you can set whether you want the product that you have flagged for the inventory to be zeroed out, or to be deleted altogether. 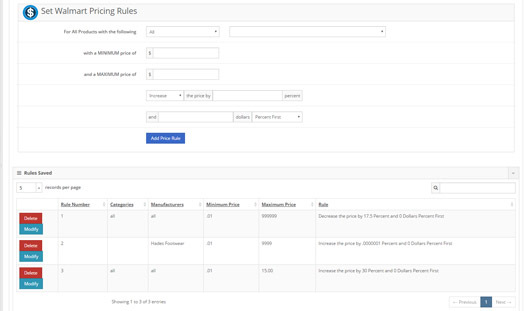 Within the rules, you can also set whether a product gets zeroed out or deleted altogether when a product no longer falls within the set filters in Step 1. The Walmart Rules that you can set are as follows. 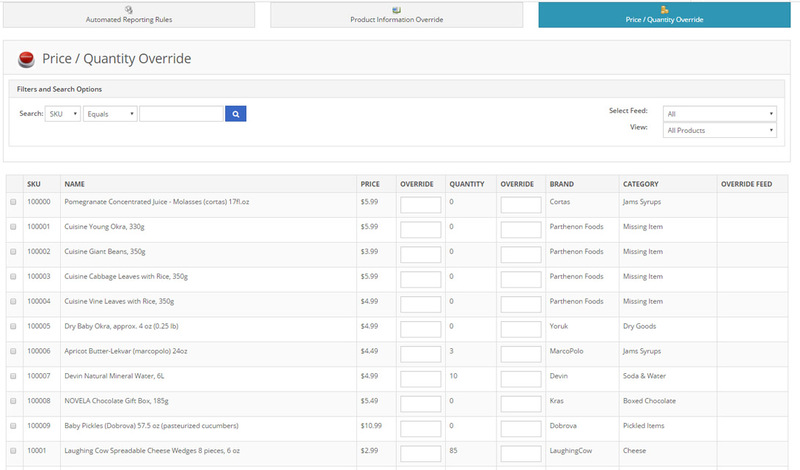 1) When updating inventory only, sync inventory (on all products / only products mapped) from the product import. 2) (Zero out / Delete ) products on Walmart that are no longer in the product import from your store. 3) Disabling a sku from the Walmart Inventory Status Screeen (zeroes out the inventory / deletes the product) on Walmart. You can override pricing and inventory permanently to values that are not the same as on your website. Eg: you can make a manual pricing change that doesn't confirm to any formula or zero out a specific sku on Walmart, even though it may be in stock on your website. The overrides will stay in place until they are removed. 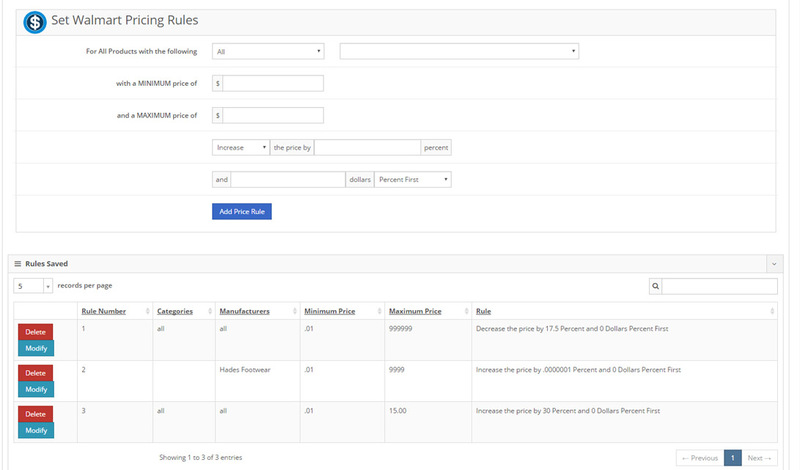 You can set advanced pricing rules that allow you to set a specific category or manufacturer to a specific percentage or dollar amount, and a specific price range... or you can apply a pricing rule to app oroducts, and then exclude specifc brands or categories by setting their own pricing rules. This can come in handy if you have products that you can't sell below a certain price that you normally post, so you can not discount those brands further. 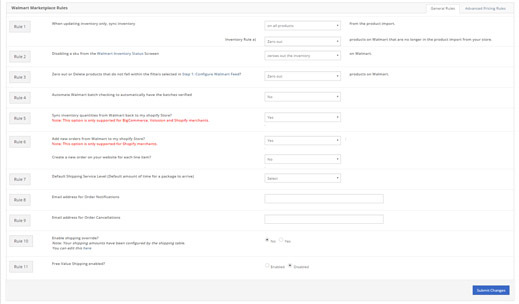 walmart Management for Product Feed Manager uses a 5 step process to List on walmart. Learn More About Selling on walmart. 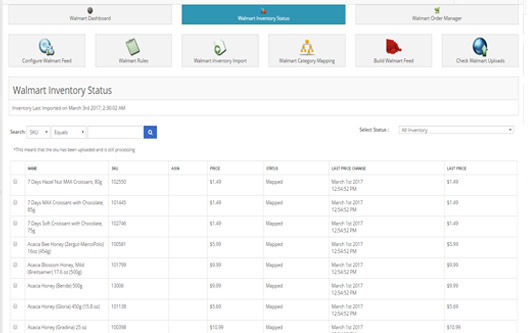 By Syncing Inventory on Walmart, you can always have your Walmart inventory match the inventory that is in your store. Learn More About Syncing Pricing. Automatically download new orders from Walmart.com, ship orders, print invoices, and more. 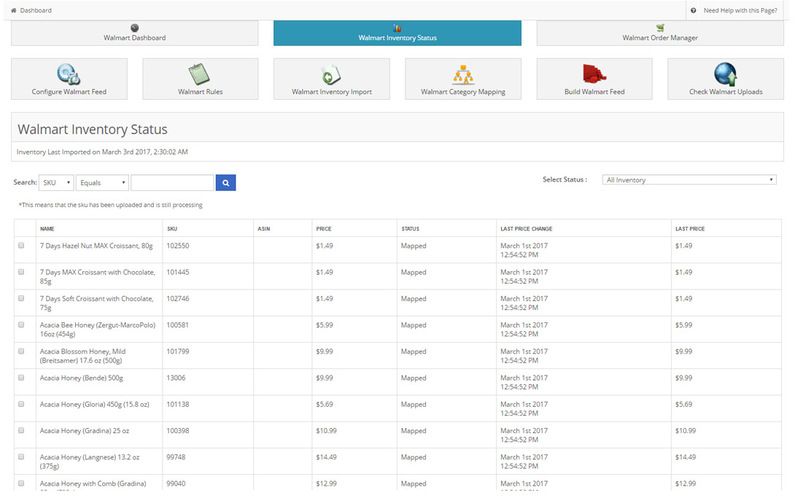 Automatically import orders to Shopify and ship from Shopify.Learn More About Walmart Order Manager.